Bagel Bites: Frozen bagel carnage littered the ramp connecting I-70 to I-435 outside Kansas City, Missouri, on October 25 when a tractor-trailer transporting 30,000 pounds of Bagel Bites tipped over shortly before 4 a.m. Fox-4 KC reports the Bagel Bites were cleared within about an hour, but all had to be thrown away. It turns out, when pizza’s on the asphalt, you cannot have pizza any time. Bananas: Rush hour traffic was snarled on Highway 101 in Oxnard, California, on October 24 after a truck carrying 70,000 pounds of bananas overturned. According to news station KEYT, none of the fruit cargo actually spilled from the truck, so The Takeout editors are divided as to its inclusion in this overturned trucks round-up. More cows: The Associated Press reports an extensive effort was underway in Atlanta, Georgia, on October 1 after a truck carrying the bovines overturned at the cloverleaf junction of Interstate 75 and I-285. The accident occurred around 3 a.m., with the darkness presumably not aiding the cow recovery effort. “We’re wrangling some cows, that’s what we’re doing,” Sandy Springs Police Sgt. Sam Worsham told the AP. Milk: A tractor-trailer transporting milk overturned on Interstate 295 in Portland, Maine, on October 26, Bangor Daily News reports. The dairy contents mingled with diesel fuel after the accident, and the remainder of the milk inside the vehicle had to be pumped out before the scene could be cleared later that day. Sugar beets: A truck traveling through Nampa, Idaho, spilled its load of sugar beets the evening of October 23, blocking an intersection. 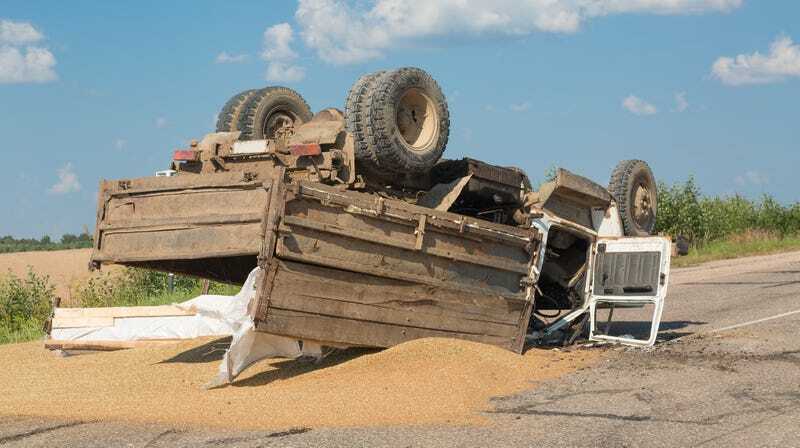 The Idaho Press-Tribune reports that police cleared the scene in less than three hours, then cited the truck’s driver for making an improper right turn.